I am a historian, and when visiting a new destination I always look for old sights. 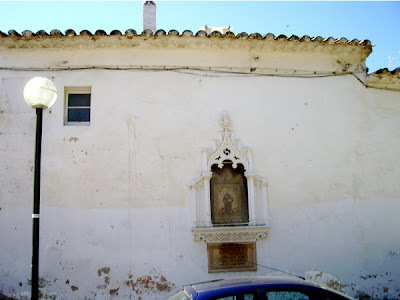 In a secluded street in Sitges I found this plain house, and it has a 341 year history connected to an unknown and mysterious guest. I found this stone memorial plaque. It has the following the original text. 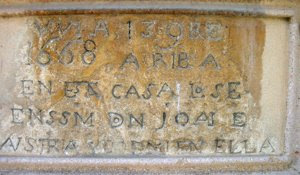 Difficult to get all the text, but 341 years ago a man called Don Juan or Joai e Austria arrived in this house. I have tried to find any reference to the man on the internet without any success. Maybe one of you may solve the mystery. Maybe this other object may share some more light on the mysterious man. 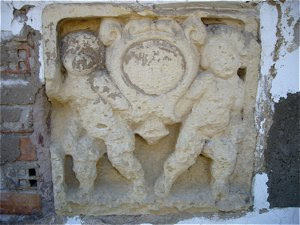 Is it a coat of arms that may be seen between these two statues? What ever it may be, history has removed all symbols within its frame.